Zach Sylvester had a tough day with a good ending at Beech Ridge. He saw a good run in qualifying get erased because of a gear rule infraction. He started at the tail end of the field. He got booted in turn three and went for a slide through the infield and he still managed to finish 10th. Sylvester’s ride in the feature was a rough one. The rules infraction that the #15 team made was partially a mistake and partially a misunderstanding, according to Sylvester. In the end, the team overcame their mistake and showed that they could put it behind them for a top 10 finish. Tony Hirschman might be quiet, but he wasn’t shy to give credit to the guy that finished behind him after the Beech Ridge race. Hirschman came home in second with Eric Beers in third. After the race, Hirschman, who is the defending NASCAR Whelen Modified Tour champion, had nothing but good things to say about the finishes that Beers has put together lately. 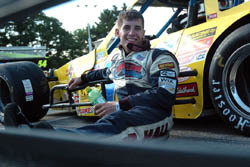 Jamie Tomaino won the 1990 NASCAR Modified Tour championship and right now, Ted Christopher is in the catbird’s seat when it comes to chasing the 2005 title. But the two Mod aces weren’t worried about championships as the laps clicked down at Beech Ridge. They were only concerned with which driver would finish in fifth place. Eventually, Christopher ended up in fifth with Tomaino on his bumper, but it was exciting getting to that point. There was racing, attempted passing and a little bit of blocking. But there was almost no bumping. “If he had kept his groove and stayed down lower, it would have been an even better race,” said Tomaino. “I guess if it’s good racing to him, it’s a compliment because usually he hardly races anyone. He likes to knock them out of the way. Christopher wasn’t going to let Tomaino have the spot without a fight though. Nevin George completely dominated the race at Beech Ridge last season. This year was a different story though. He started on the pole and led a handful of laps early before his car started falling through the field. Eventually, the transmission gave up on his #0 and he finished 25th. Donny Lia finished second to George last season, but like George, he didn’t have a great night at the track this season. Lia got spun in the middle stages of the race over in turn two. “I was trying to squeeze into a big hole there and not get stuck up top and as I came down, Kenny Barry tried to fill that hole and he wasn’t even close,” said Lia. “He got me in the left rear nerf bar and turned me around. The snafu led to Blewett being down three laps by pitting under green, and not just a single lap for bringing out the caution on purpose. There have been a lot of great drivers in Bob Garbarino’s Mystic Missile #4 cars over the years. Most of those drivers have won in the famed #4 cars. After Beech Ridge, Jerry Marquis can add his name to that list as well, and he couldn’t be happier about that fact. Jerry Marquis won the race at Beech Ridge and put in a hard day’s work doing so. But the most impressive drive of the night might have come from a rookie in the race. Tyler Haydt qualified 14th in his first Beech Ridge appearance, but his day turned bad on the seventh lap when the right front tire went down on his Don King-owned #28. Haydt went three laps down, but when the race was over at lap 150, he was solidly in the top 10. Somehow, Haydt ended up finishing seventh. And Haydt emphasized that the finish was a team effort. Obviously, Haydt took an instant liking to Beech Ridge. “I like this track a lot,” said Haydt reflecting on his first race there. Blewett circled around under caution waiting to pit, but before the green flag came out signaling that it was ok to come down pit road, the other green flag came out instead and the race was back underway. “For some reason, they never opened pit road until it went green. If you pit under green, you might as well park it. “I’m really glad to give Bob Garbarino a win this year,” said Marquis. “It gives me great pride and pleasure. I’ve been able to drive for Bob Judkins, Lenny Boehler’s team and now the Mystic Missile. Also having a great run affected by a flat tire was John Blewett, III making a start in the #00 Joe Brady-owned car. However, fate was not a kind to Blewett as it was to Haydt. Blewett was credited with 20th after he went three laps down with a flat late in the race and had no time to make any of the laps up. Beers meanwhile enjoyed his race with Hirschman and winner Jerry Marquis. Now, he just hopes to finish ahead of them, and the rest of the field, a few times. Eric Beers and his #3 “Ole’ Blue” car has been on a tear lately. They have done everything but win a race on the NASCAR Whelen Modified Tour, and when it comes to that feat, it’s more of a question of when, and not if, it will happen. Beers was third at Beech Ridge. And this week brings another chance at a win for the personable driver. Steve Whitt had another strong run at Beech Ridge. He put together top five finishes at Waterford Speedbowl and New Hampshire International Speedway recently and backed that up with a fourth-place finish at Riverhead. Second place isn’t bad, but Tony Hirschman would have really liked to have finished one spot better at Beech Ridge. 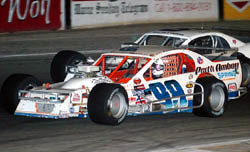 Hirschman has visited victory lane in the state of Maine before by winning a Busch North race at Oxford back in 1992, but he has never won a Maine Modified race. That’s a fact that isn’t lost on him. Dave Etheridge had his second top 10 finish of the season at Beech Ridge. He finished ninth under the guidance of new chief Brian Schofield. For most of the night at Beech Ridge, Doug Coby was in the top 10. He faded late in the race though and ended up 14th. Whitt thinks that starting near the front helped his cause. He was sixth on the grid for the 150 lap race. Whitt has been one of the hottest drivers on the Mod Tour lately and Speed51.com will have story on his recent races coming soon. Lia did battle back into the top 10, but got hung out with a handful of laps left in the race and finished 11th at the end of the night. Ted Christopher had things to be happy about and things to be frustrated about after the race. He finished fifth, but didn’t particularly enjoy the 150 laps that it took to get there. But the fifth place finish did help to put him in a better mood after the race. 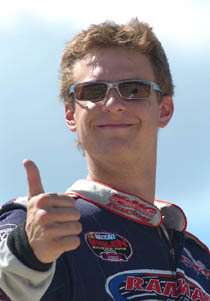 Finishing a few spots behind his twin brother Ted, but smiling about it after the race, was Mike Christopher. The driver of the Hillbilly Racing #79 car came home in the eighth position. The race didn’t start out that well for MC early on, though. Christopher has been appearing more and more in the top 10 lately and he’s happy about that. Earlier, we talked about the battle that Jamie Tomaino had with Ted Christopher for fifth. The bad news for Tomaino was that he didn’t win that race, but the good news was that finishing sixth wasn’t too shabby either. Tomaino came on strong towards the end of the 150-lap race and that was according to plan. Coby was the last car on the lead lap at Beech Ridge and that is something he is used to. And finishing as the last car on the lead lap also brought another task with it. “We ended up in tech after the race because they made the last car finishing on the lead lap the wildcard for inspection with the big boys,” said Coby.